Delta Force Paintball is constantly implementing new initiatives to make your paintball adventure more enjoyable. Now, we have something that will satisfy everyone’s appetite… literally! Players at Delta Force Dingley will be able to purchase a freshly cooked nine-inch pizza for lunch. For only $9.95, this mouth-watering pizza will be delivered from Pizza Hut and will give you the energy to storm through the afternoon games. A range of flavours will be available and we plan to bring this delicious lunch to all centres across Australia shortly. 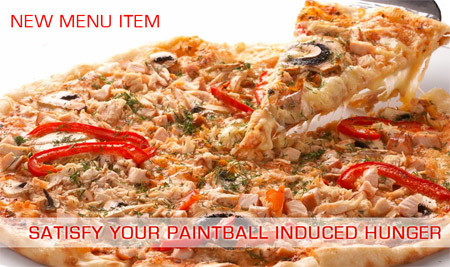 The pizza lunch can be pre-purchased or ordered on the morning of your paintball game from the onsite kiosk. The kiosk also sells a variety of snacks and drinks to help you refuel and replenish throughout the day. So for all of those paintball players who are looking for the ultimate paintball quest, come on a Delta Force Paintball experience and satisfy not only your need for action-packed adventure but also your appetite.